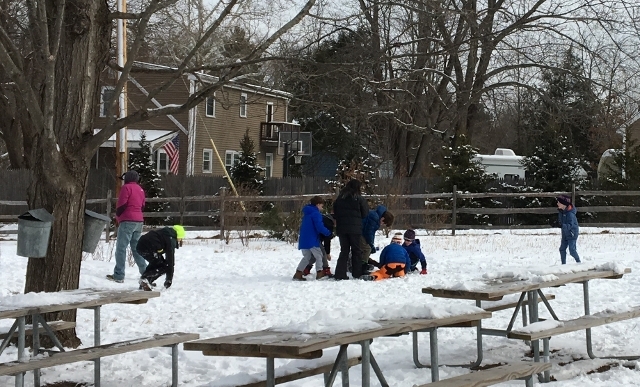 Posted on February 22, 2019 by Elissa L.
February School vacation week camp was just about perfect this year. Kids got to slide like otters in the snow, practice their aim with snowballs at the icicles below the waterfalls and track the behavior of coyote, raccoon, squirrel, and turkeys. Another day, the campers placed taps and buckets on two of the sugar maple trees in the nature play area to collect sap for the Natick Community Organic Farm. We’ll see that sap again on May 5 when it returns in the form of maple syrup for our annual Birds and Breakfast pancake breakfast and birding walks. If you missed February vacation week, April will be just as much fun with birds and mammals more active, early flowers in bloom and spring peepers and woodfrogs calling.Visitors have been reporting river otter in the Wildlife Pond and this afternoon I got lucky and saw this large otter on an ice flow munching on a fish. While not a great photo, look for the very dark shape in the water on the upper right, and borrow a pair of binoculars at the visitor desk to look for yourself. 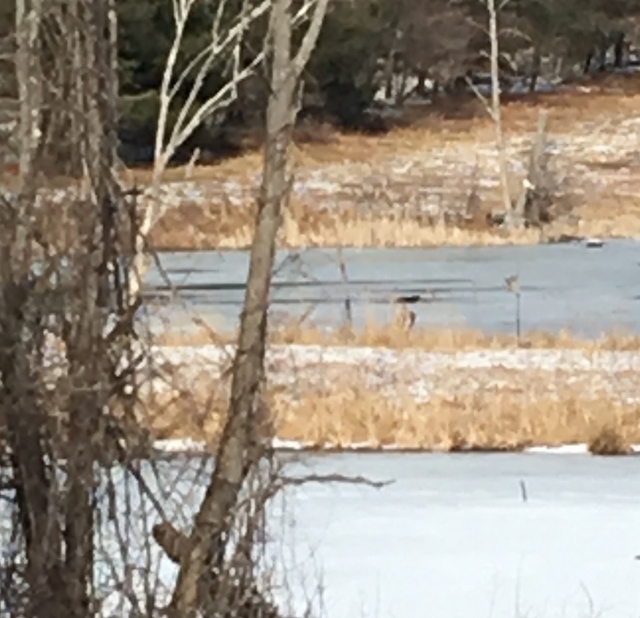 Hooded mergansers, mallards, house sparrows, cardinals, black-capped chckadees, tufted titmice and red-tailed hawks are also getting active. This entry was posted in news on February 22, 2019 by Elissa L..